With the destruction of the Palast der Republik, the site of the royal palace continues its long history as the central showplace for state-sponsored projections of national identity. On a frigid February day in 2005, an art installation consisting of seven giant, illuminated letters that spelled out the German word Zweifel (doubt, in English) appeared on the roof of a monumental modernist building in the center of Berlin called the Palast der Republik (“Palace of the Republic”). The building was by then an empty shell, slated for demolition, and the letters—each 8 meters (about 26 feet) high, were big enough to be seen a mile away. Glowing brightly into the dim Berlin winter night, the massive letters were an embodiment of the doubts that many Berliners had about the future of both the Palast der Republik and their recently-reunited city. 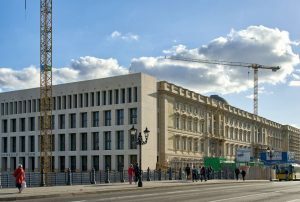 The building had been a symbol of the East German government’s dictatorial rule and hypocrisy, but despite this association, many felt it was important to preserve the physical traces of the regime’s past in Berlin, its former capital. Soon after the Germany’s reunification in 1990, the government had quickly decided to demolish the building, but protests and debates over its preservation went on for 13 years before the Palast der Republik was finally erased from the city’s historic center. The contention over this site shows how architectural preservation is often about much more than just the building itself—the real issues are often about the memory and identity of the people who create and use them. The Palast der Republik was especially contentious because it stood on the site where Berlin’s royal palace, the home of the Prussian monarchs, had formerly existed. This palace (or Stadtschloss) had been established in the 15th century and by the 17th century, it had become a splendid baroque palace and an important symbol of the Prussian royalty and its power. 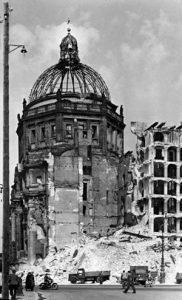 The Stadtschloss was damaged by bombs in World War II, but it was still standing when, in 1949, Berlin, and Germany as a whole, were divided up and reconstituted as East and West. 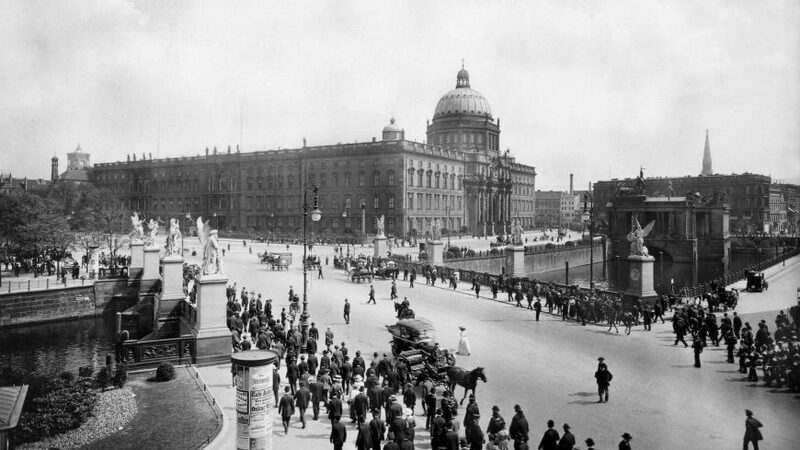 The postwar division lines meant that the royal palace, as well as the rest of the historic city center, became part of East Berlin, capital of the German Democratic Republic (the official name for East Germany, abbreviated as “the GDR”). 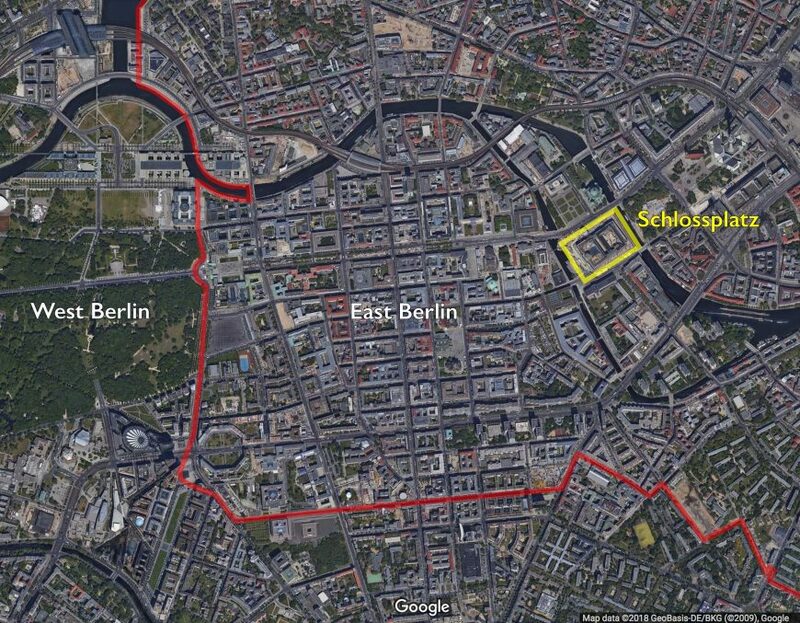 This border would later become the path of the Berlin Wall, which was located just a mile west of the royal palace. The communist government of East Germany recognized the importance of the Stadtchloss, but they saw it as a corrupt symbol of monarchical power. Wanting to show their disdain for the Prussian monarchy and its history, they demolished it to make way for a set of monumental modernist buildings organized around a central plaza designed to hold official political events. However, because of the GDR’s limited budget, the new plan was never entirely realized, and until the early 1970s, the site where the palace had stood remained a barren parking lot where tanks made U-turns during state-sponsored parades. In the early 1970s, Erich Honecker became the leader of East Germany. The economy was struggling, and one of his goals was to raise the standard of living for people in the GDR through what he called Konsumsozialismus (consumer socialism). East Germans—and especially East Berliners, who could easily pick up TV and radio signals from West Berlin—were painfully aware of the goods and other amenities available in the West, and Honecker sought to prove that the same level of luxury was available in a communist society. It was under his leadership that the massive Palast der Republik was finally constructed on the site of the old royal palace. This new “palace” housed parts of the East German government, with spaces for parliament and party meetings, but it was chiefly a palace of pleasure—with three restaurants, a bowling alley, a movie theater, a concert hall, and numerous shops, all accessible to the public. 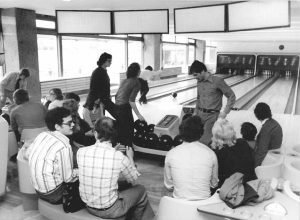 Though it might seem like a strange combination, the idea of mixing an entertainment and shopping center with governmental meeting rooms was an attempt to show the East German people that the leaders of the GDR were interested in their citizens’ everyday welfare and happiness. The exterior of the Palast der Republik recalls American shopping malls and office buildings from the 1960s. This is because the Palast’s designers, a collective of architects led by Heinz Graffunder, were taking their cues from the latest commercial architectural styles in the West. With its warmly-tinged reflective glass surrounded by long strips of white marble, the Palast der Republik combined the approaches of mid-20th-century modernist design (appearing sleek, repetitive, and monolithic, using new materials like tinted glass) with shapes, lines, and masses that recall the former royal palace (which had featured neoclassical columns and sumptuous materials like marble). The glass façade was designed to symbolize governmental transparency—though this was a deeply hypocritical message, since East Germany was, in reality, a repressive police state. East Germans were not completely satisfied with the government’s attempts to appear more open or to fulfill its people’s desire for consumer goods. Most East Germans had, as a matter of survival, learned to effectively manage the stark difference between state ideology and their own private lives. Even though the Palast became a GDR tourist destination, it also quickly acquired cheeky nicknames such as “Ballast der Republik” and “Erich [Honecker]’s Lamp Shop.” The Palast came to symbolize the GDR’s hypocrisy, but it also presented citizens with opportunities for personal enjoyment—and they made ample use of them. By the late 1980s, protests across the Eastern Bloc culminated in the fall of the Soviet Union and the opening of the Berlin Wall in November of 1989. As home to the GDR parliament, the Palast der Republik was the site of the East German government’s historic final vote in 1990 to join the Federal Republic of (West) Germany. 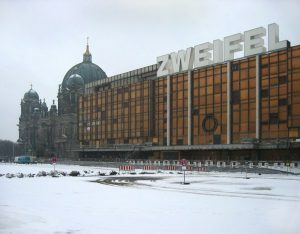 The reunified federal government immediately found the Palast der Republik to be uninhabitable due to asbestos contamination, and closed the building. It was clear that the Palast had to be either renovated or replaced. 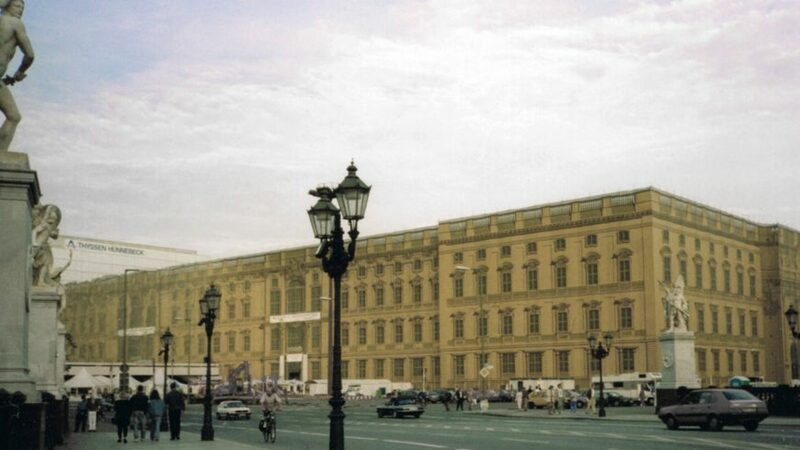 In the early 90s, the center of Berlin was in the midst of a building boom, and the Schlossplatz was prime real estate. Soon, proposals by prominent architects appeared: on the one hand, the original East German architect of the building, Hans Graffunder, proposed the addition of a reconstruction of the Stadtschloss to the existing building; while on the other, a group of wealthy and influential figures from the West began to advocate for the complete demolition of the Palast in order to make way for a full reconstruction of the earlier baroque building. Groups rallied around each of these sides, with protests, campaigns, and debates that reached from the streets to the floor of the German parliament. 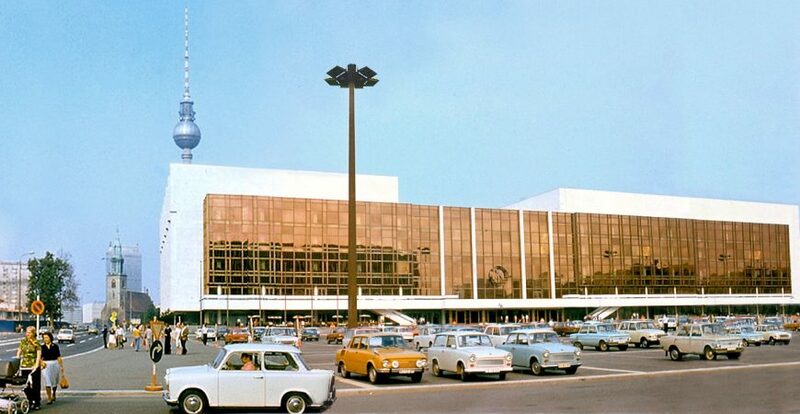 Just as the GDR had justified its demolition of the Stadtschloss by connecting that building to the monarchy, the advocates of rebuilding the Stadtschloss claimed that the Palast der Republik was ruining the city’s historic fabric with its “totalitarian” forms. To illustrate their proposed “healing” of the city, the supporters of the Stadtschloss reconstruction erected canvas on scaffolding that functioned as a trompe l’oeil , mimicking the old baroque façade along the edge of the parking lot next to the Palast der Republik, and creating the illusion for passersby that the Prussian palace had actually been rebuilt. East Berliners had never loved the Palast, but as soon as it was slated for demolition, many started to recognize the building’s value as a tangible expression of the nation’s fraught history. All over former East Berlin, GDR buildings—the buildings they had grown up with—were being torn down and replaced by shiny new office towers. Why not keep the Palast as a memorial to the city’s and country’s tumultuous past? Most buildings from the 20th century, including the United Nations complex in New York, were constructed using large amounts of asbestos, and many had been effectively remodeled. Surely the Palast der Republik did not have to go. A Symbol for the Reunified Capital? 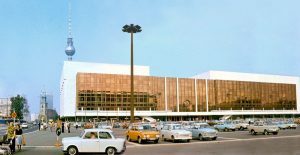 The political battle over whether to tear down the Palast der Republik, and what to build in its place, lasted for more than a decade. The government heard endless debates at both the city and federal level, and multiple councils of experts were designated to make recommendations about what to do with the site. Fundraising and marketing campaigns were launched by those who sought to reconstruct the Baroque palace, and protests were staged by those in favor of safeguarding the East German building. Finally, in 2003, the federal government voted to demolish the Palast and to construct a new version of the Stadtschloss. This new structure was to be named the “Humboldt Forum,” and would function as both a museum and public space. 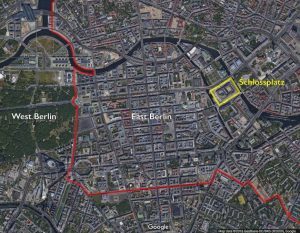 The result would be the architectural restoration of the Baroque character of Berlin’s historic inner city and an extension of the cluster of museums that already existed just to the north of the palace on “Museum Island”—arguably Berlin’s biggest tourist attraction aside from the Berlin Wall. After years of funding delays, construction began on the Humboldt Forum in 2015. 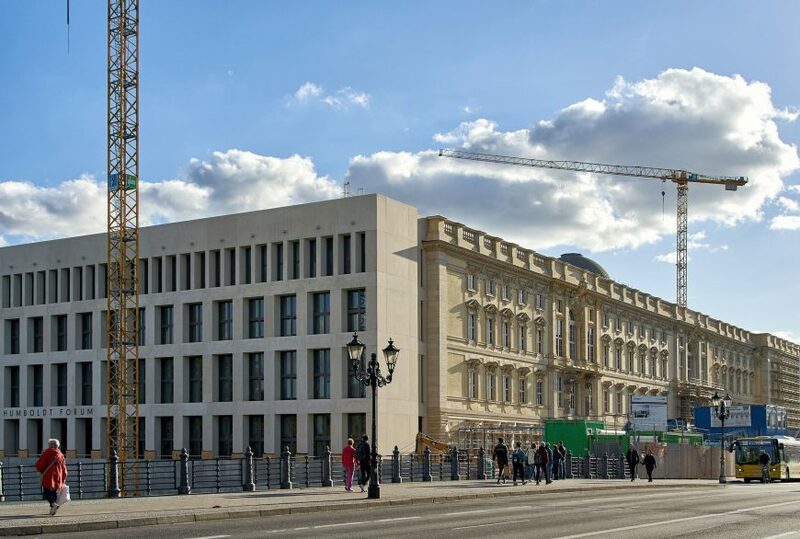 Its baroque exterior is a faithful reconstruction of the Prussian palace on three of its sides, with the fourth side featuring a flat, stripped-down design that resembles the office buildings recently constructed elsewhere in Berlin’s city center. Inside, enclosed courtyards provide access to the building’s various exhibition spaces, which will house objects currently in Berlin’s Ethnological Museum and its Museum for Asian Art. Political and cultural power, it seems, will always be a prominent issue on the site of the Stadtschloss. With the destruction of the Palast der Republik, the site of the royal palace continues its long history as the central showplace for state-sponsored projections of national identity. In November of 2006, official marketing banners appeared outside the partially-demolished Palast der Republik, proclaiming in German and English: “Eine demokratische Entscheidung – A democratic decision.” The democratic German government did make the choice to tear down the Palast der Republik, but the decision reveals the deep societal rifts that still exist between the former East, where unemployment is high and many people feel underrepresented, and the West, which is still the center of financial and political power. 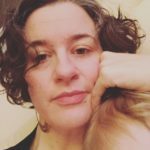 Architecture—even that which is deemed ugly—can be important to the people who have lived with it. Advocates included both former East Berliners and people from West Germany and the international community who saw the building as not only being of historic value, but as a potential site for experimental public events.